The data used in this Atlas were primarily drawn from SCAR-MarBIN (Scientific Committee on Antarctic Research—Marine Biodiversity Information Network, www.scarmarbin.be ) and its successor project ANTABIF (the Antarctic Biodiversity Information Facility, www.biodiversity.aq). 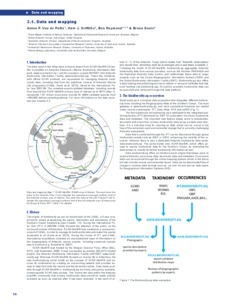 These two initiatives, both official SCAR products, are responsible for managing Antarctic biodiversity data, including that from the ambitious Census of Antarctic Marine Life programme (CAML; Danis et al. 2013), linked to the International Polar Year 2007-09. The complete expert-validated database, including records from beyond the SCAR-MarBIN primary area of interest up to 40°S (Map 1), represents 1.07 million occurrence records for 9064 validated species from ~434,000 distinct sampling stations. For more information on the data coverage see Chapter 2.2. 2.